Each team will be covered in alphabetical order. This article we’re covering the Pittsburgh Pirates. And, while we here at The Dynasty Guru are primarily baseball obsessed, we’ll also be touching on some music we’ve enjoyed from each team’s home state. Enjoy, and leave us your question and comments below! In 2017, this young switch-hitter had himself a breakout. He clobbered 26 home runs and drove in 90 runs all while being very valuable in OBP leagues (less so in AVG leagues). At 25, he displayed all the tools and prospect pedigree to dream up of a wonderful upside filled dynasty career. Sadly, 2018 has been disappointing thus far for Bell and his owners (yours truly included). One home run and .092 ISO are dreadful. A .244 average isn’t going to cut it when you’re not providing any pop. Even more surprising is his .311 OBP. I believed the 25-year-old first baseman to be an absolute lock for strong on-base numbers, but that has not been the case thus far. Let’s find out why. The More Things Stay the Same, The More Things Change? There are an astounding amount of similarities between his 2017 season, and the first month of the 2018 season. Though maybe this should be expected. Over the course of the Bell’s short career, he has been incredibly consistent at the plate. One could reasonably assume this would lead to similar results, but here we are with not similar results. So what’s going on? Interestingly enough, the problem seems to not be in his approach, but rather at the quality of contact he is making. Despite a similar launch and exit velocity to 2017, Bell is making less hard contact, and connecting for fewer barrels. Welp, the Bellman is not hitting the ball as hard. Why? If Bell is executing the same approach as he was last year when he broke out, then why are the results so different. That would be because opposing teams have changed their approach against him. Teams have been throwing him more breaking pitches, and there’s a reason for that. Breaking pitches are Bell’s least favorite pitch. He whiffed at them at a 31.4% clip last year, and this year he’s swinging and missing at them even more (38.6%). Teams haven’t stopped there though. In 471 plate appearances in 2017, Bell had a defensive shift employed against him 12 times. This year, in 108 plate appearances, teams have implemented the shift 33 times. That’s a 28.1% increase and the most significant difference between the good version of Bell and this version. At first, I was a bit confused given that the Pirates first baseman does a fantastic job of spraying the ball around the park. 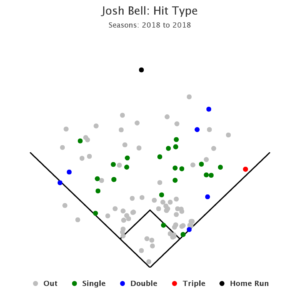 However, if you look at Bell’s hits this season, only one of them has come in the infield, and very few of his hits have been ground balls. That’s a problem when you’re generating ground balls 53% of the time, and helps explains why Bell’s wOBA drops from .333 to .149 when teams implement a shift. That explains why there aren’t any indicators that seem to imply that there’s much in the way of bad batted ball luck, as his BABIP is hovering around his career norms and in line with most projection systems. Beat the Shift, Save the Stats? If I’m right about the shift hurting Bell, then he’s going to need to make an adjustment in order to produce numbers similar to last year. 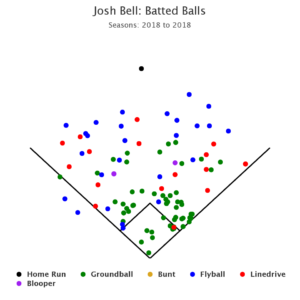 Everything about Bell’s approach at the plate is what you’d like to see in a hitter, except for his groundball rate. 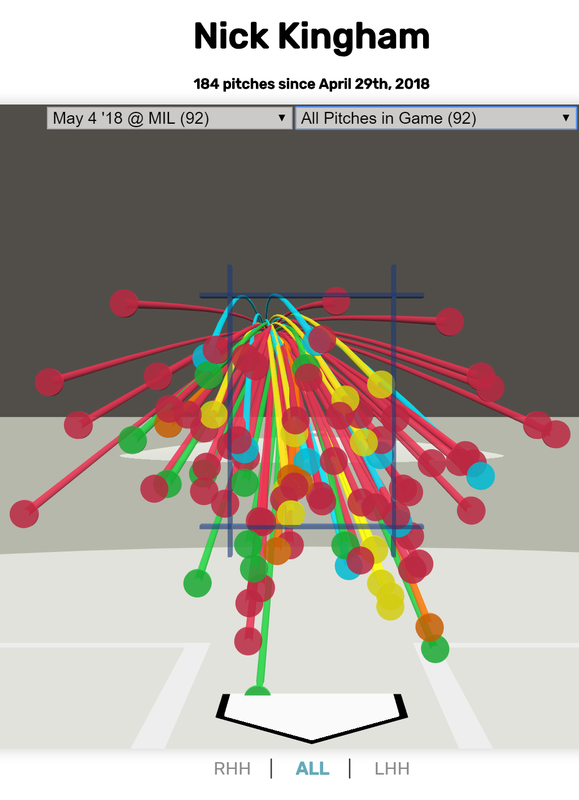 Currently, he’s not squaring up as many pitches because teams are feeding him more breaking balls, and when he is making contact it’s straight into the ground. I’d expect the young first baseman to figure something out, as he’s an extremely talented hitter. However, this is going to demand patience from his owners. If you’re going all in this year, then it’s probably not a terrible idea to sell Bell. He’s 25 with all pedigree and not too far removed from success that you could obtain a more stable asset. The original intention of this Triple Play piece was to write on closer Felipe Rivero. Here’s the quick and dirty on him: he’s good and he’s a top-5 closer. If you’re in your contention window, invest in him as a high-level, short-to-near-future bullpen arm. Kingham’s emergence has commanded our time and attention. I am being a little sneaky as he still qualifies as a prospect. However, he’s up on the big-league roster and he’s succeeding. Also, there’s the question about whether he’ll continue when the prize of the Gerrit Cole return, Joe Musgrove, comes back from the DL. My response is plain and simple: if the Pirates want to be taken seriously, there’s absolutely every reason to believe he should remain with the club. It’s taken 8 years for Kingham to arrive. When he was selected in the 4th round of the 2010 draft, 15 picks ahead of James Paxton, there wasn’t much buzz because there wasn’t much known. As he progressed through the system, reports began trickling out that Pittsburgh may have a little something in the way of a durable starter. He was a big bodied righty who pounded the strike zone and whose numbers always seemed to outpace his actual stuff. His three-pitch mix (a low 90’s two-seamer with heavy sinking action, an average change, and a show-me curve that Statcast picks up as a slider) never fully enamored the scouts looking at the tantalizing Jameson Taillon and Tyler Glasnow. Yet Kingham plodded along in a slow and steady pace. In fact, there were reports as far back as 2014, the first year Kingham arrived at Triple-A, that he was polished and ready to make his debut. Sadly, as these approaches tend to go with organizations who are not aggressive with their arms, Kingham blew out his elbow after nearly five seasons in the minors and needed Tommy John surgery. This injury forced him to miss almost all of 2015 and 2016. Sidebar, WHEN WILL ORGANIZATIONS LEARN THAT SLOW ROASTING PITCHERS IS A DUMB IDEA? When Kingham returned, reports were, by and large, the same as they have always been. Pounds the strike zone, somewhat above average fastball thanks to the sinking action, average secondaries. Yet he continued to outperform his reports. After starting the 2018 season with an ankle injury, he went down to Indianapolis and posted a 22.5% K-BB%, a microscopic HR/FB rate, and a 2.99 xFIP. After being called up to majors a couple of weeks ago, Kingham is exactly as advertised. These graphs below underscore the self-evident truth that he pounds the strike zone at a rate of nearly 50% of all pitches. This profile does not add up to maintaining an 11+ K/9 rate, but it does provide confidence in sustaining the BB/9 ratio. It does not suggest the continuation of a sub 3 ERA/FIP/SIERA, but it does suggest a sub 4. Especially when considering that his hard rate is 10% higher than league average yet his HR/FB% is nearly league average. One understated ability Kingham has displayed is his ability to work deep into games. Throwing 90+ pitches in the first two games, pitching to contact, and is in his TJS honeymoon period. This could be a solid investment for those in QS leagues. So, what happens when Neal Huntington makes a decision in a few weeks? Should he keep Chad Kuhl in the rotation? 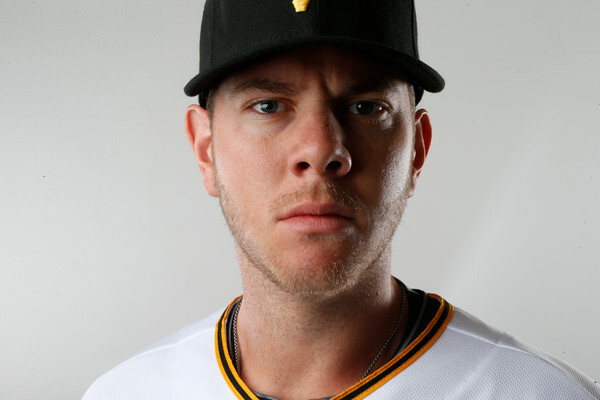 Should Kingham become a better version of Steven Brault? If the Pirates have any sense, they’ll let him fly. Does he really need a 9th season in the farm? I’m buying Kingham where I can with the understanding that he’ll probably be figured out and wind up as an SP4. SEND ME ON MY WAY – RUSTED ROOT. ANY OTHER CHOICE IS WRONG. We should all be familiar with it by now, but just in case here’s the reminder: high school outfielder from Georgia drafted 9th overall in 2013 by the Pirates with plus-everything. Expected to move relatively quickly through the minors for a high schooler, he never spent a full season at any level of the minors and reached Triple-A in 2016 21-year-old. Along with flashing his toolsy set of skills at each level of minors, injuries have followed Meadows everywhere he’s gone, thus leading to why a top prospect who’s moved swiftly through the ranks has yet to have a major league at-bat. This season you were probably expecting to finally get to slot him in your line-ups, and in spring training the Pirates seemed like they were giving him every chance to take hold of an outfield position. Until they traded for Corey Dickerson. 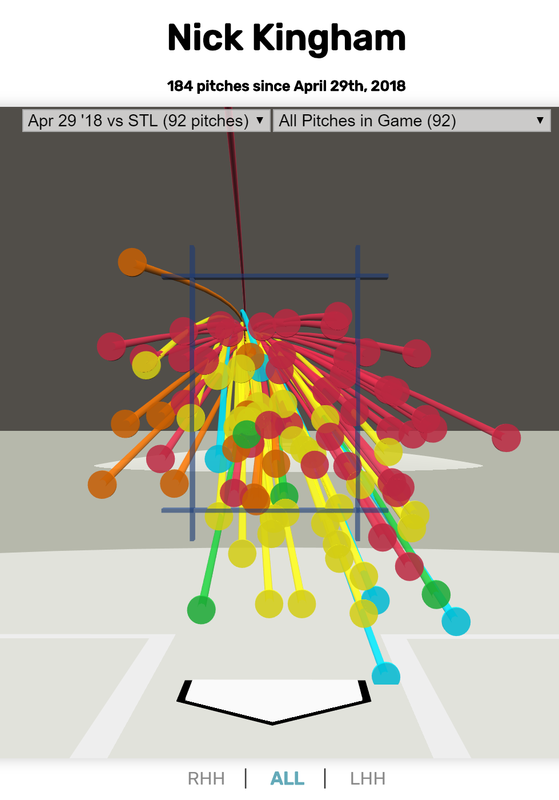 Up to that point, Meadows had been having a successful spring, and he ended up with a .368/.429/.737 slash line, two walks, two strikeouts, a homer and eight RBIs across 19 at-bats. You would think that spring stat line from a prospect would have been good enough for the Pirates to let him run with it, but sadly it did not happen. HOLD HIM. He’s still really good, and he’s still really young. He will eventually get a chance to play and it will be worth it. He may be Byron Buxton lite (in both production and DL time) but give him a chance to show his skills at the major league level before giving up on him. I don’t blame you if you’re tired of waiting; five years is a long time. But you’ve waited this long, so hang in there just a bit longer.